Well, I guess it's about time the '90s trend caught on to me. I am generally not one to follow trends (I don't think I will ever understand the appeal of Uggs or Birkenstocks) but I've got to admit, I've been all for a few of the more recent ones to emerge. Matte liquid lipsticks, lace-up bodysuits, and now the ever-so-popular '90s trend that has dominated style scenes past and present. I'm a bit late hopping on the choker bandwagon but seeing as they're still super popular right now, I'm not too concerned. It's actually pretty funny that I'm rocking chokers now because I definitely did the same back in second grade as well. My seven year old self was all for the tattoo ones (which have also made quite the comeback), whereas I now prefer the velvet style. Who would've thought I'd be wearing the same look thirteen years later? Trends can be pretty amusing that way. While the primary aesthetic I'm channeling here is the '90s, I definitely had to throw in some of my signature '70s, boho appreciation as well. 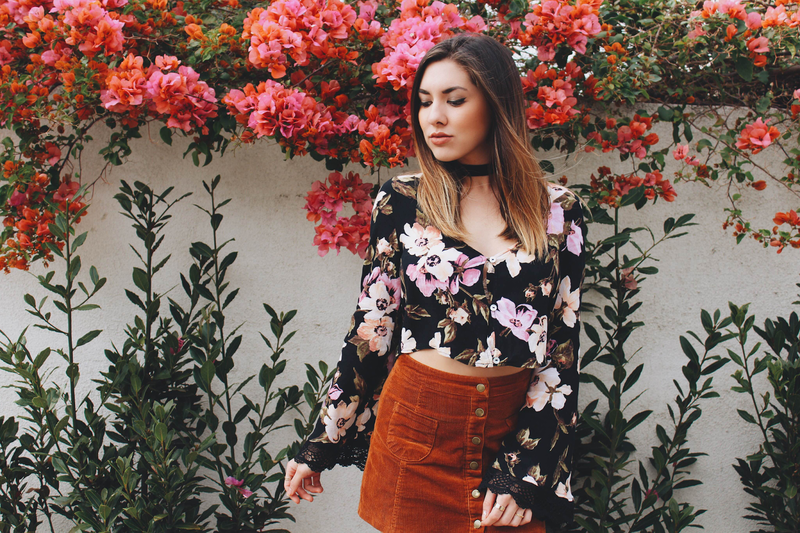 The floral print and bell sleeves of this gorgeous floral top give my ensemble a lovely California flare while my corduroy, button up skirt is an undoubtable '70s staple. 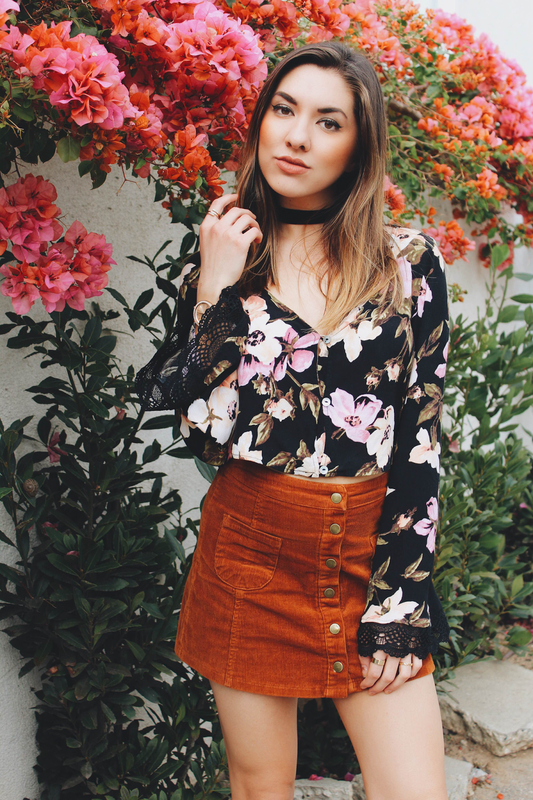 I promised you guys some Coachella looks, so here is the first of them for ya~ Other ways to style this crop + choker combo for the desert could be switching out the skirt for a pair of killer denim shorts and trading the heeled sandals for some ankle boots. 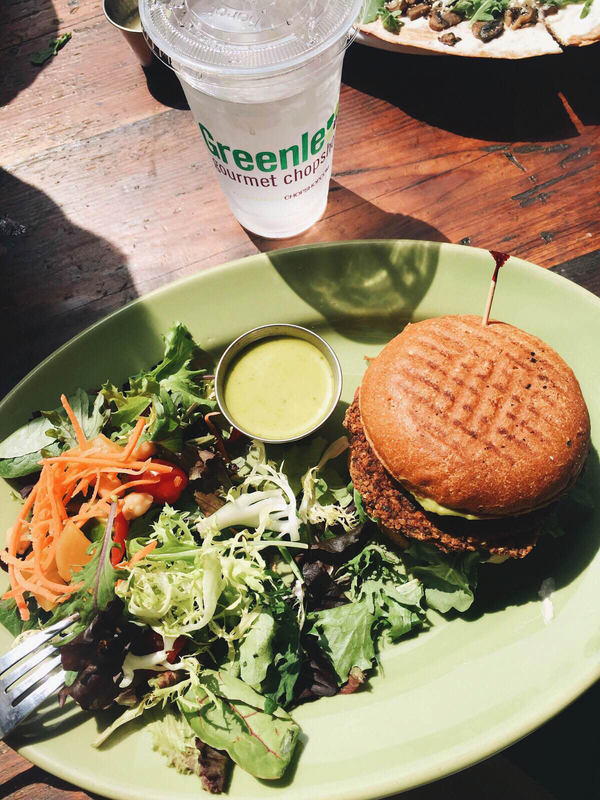 I recently had the pleasure of being introduced to a chain of restaurants called Greenleaf Gourmet Chopshop and I've gotta say say, I'm very pleased to have received this introduction. Anyone who knows me knows that I am a massive foodie and love finding new places to eat, so it's always a double win when the place I check out is actually amazing and becomes a spot I can easily see myself returning to. Greenleaf was just that! They have a number of restaurants around LA and a recent trip to my nearest one in Beverly Hills left me feeling both comfortably full and highly satisfied with my meal. 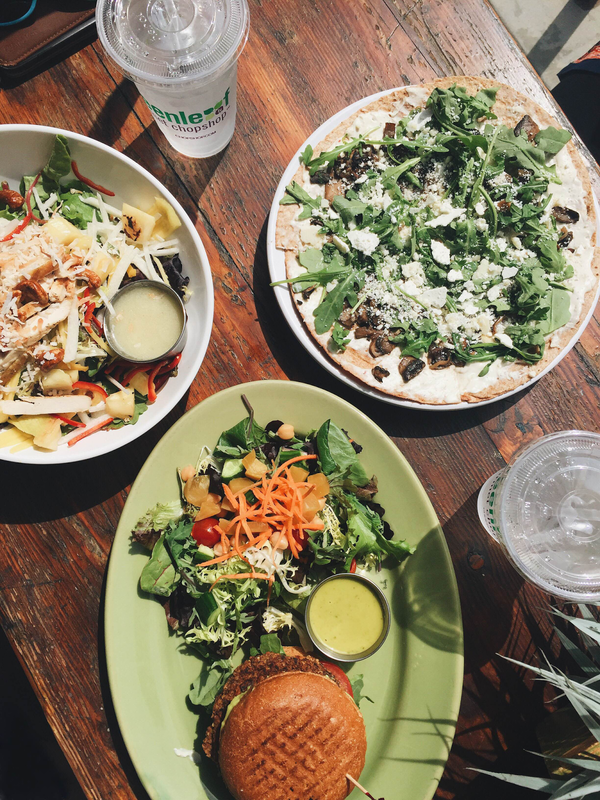 They have a wide variety of healthy options to select from, some of which include salads, sandwiches, entrees, pizza, juice and even tacos. As a matter of fact, there were so many options that it was a bit difficult for me to select just one thing! I guess that means I've got to go back again, huh? I got the California vegan burger while my guests got the lemongrass chicken salad and wild mushroom & truffle pizza. Everything was absolutely delicious - now I love myself a good, greasy burger but this vegan version was honestly just as tasty as any other regular burger I could have gotten. 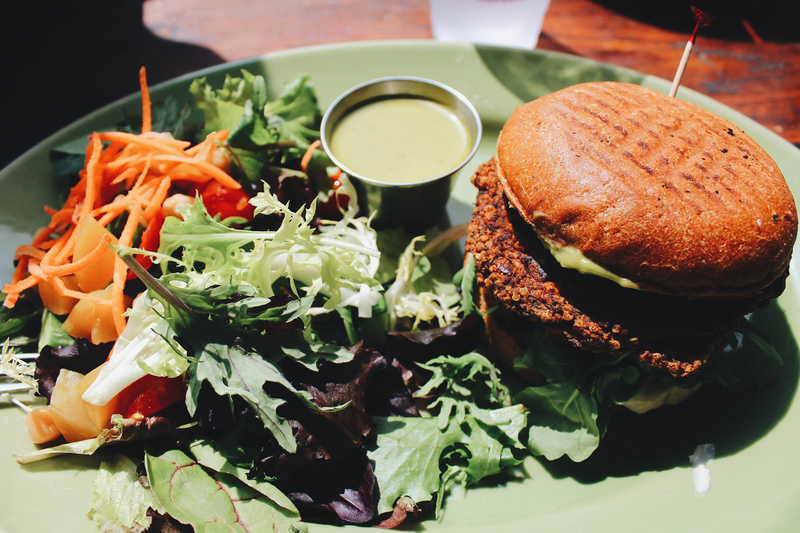 The quinoa patty was rich with flavor and the accompanying arugula salad was equally as delicious. My guests were also just as pleased with their choices. For myself and many fellow students alike, the first days of spring break have finally started and the opportunities to embark on a spontaneous adventure are vast. 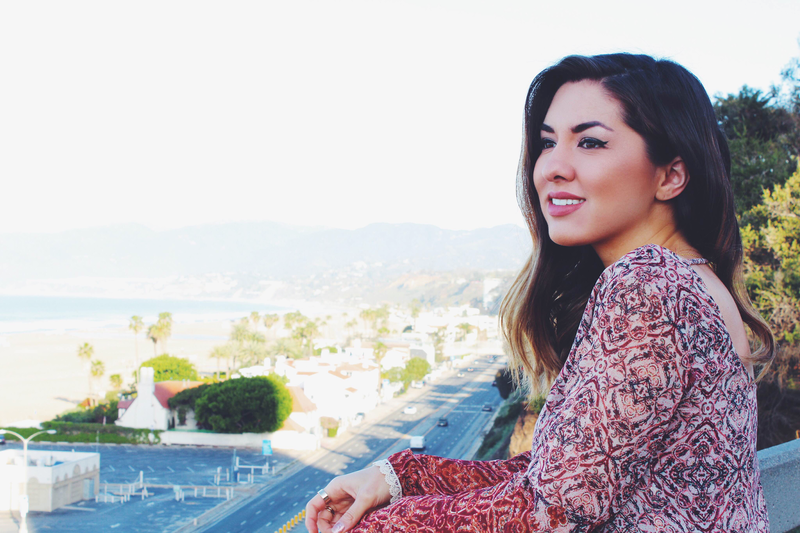 LA is a fascinating city on its own that has a new adventure awaiting just around every corner, but on those days when the wanderlust bug bites and I've got that urge to see more, there's always the Pacific Coast Highway to take me yonder. Now if you know me, you'll know that regardless of where I am this week, I always have to have a strong makeup game. 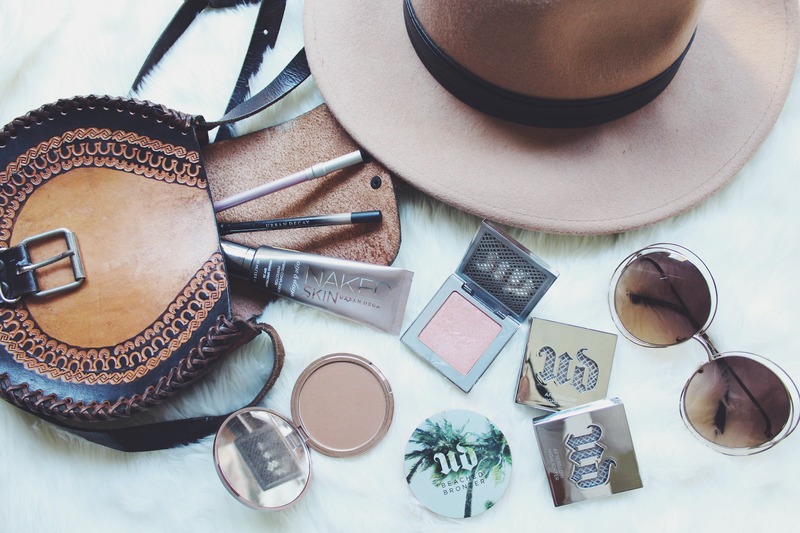 And luckily for us adventure and makeup enthusiasts, Urban Decay makes it easy to achieve this no matter where your travels take you to. If you've seen my previous beauty post on here, you'll know that I'm head over heels for Urban Decay and the large variety of high quality products they have to offer. You can thus only imagine my joy when I was asked to participate in College Fashionista's exciting new partnership with them! This campaign is gorgeously assembled and highlights (literally) how any spring break adventure can easily be both fun and fabulous. Could you get a better combination than that? You've simply got to check it out for yourself. Click here to see the full feature! 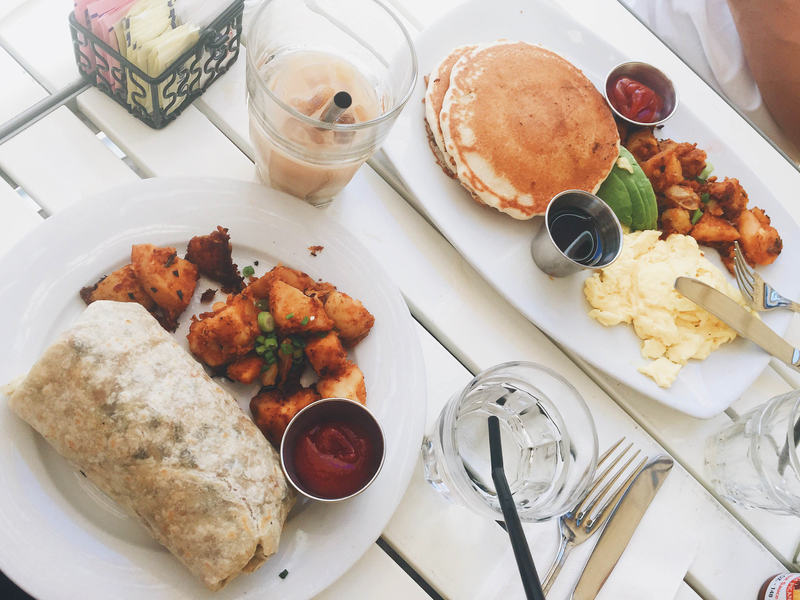 Seeing as I'm constantly spamming your Instagram feed with photos of egg sandwiches, avocado toast and other breakfast treats, I figured it's about time I put up a post listing my favorite brunch spots here in LA. 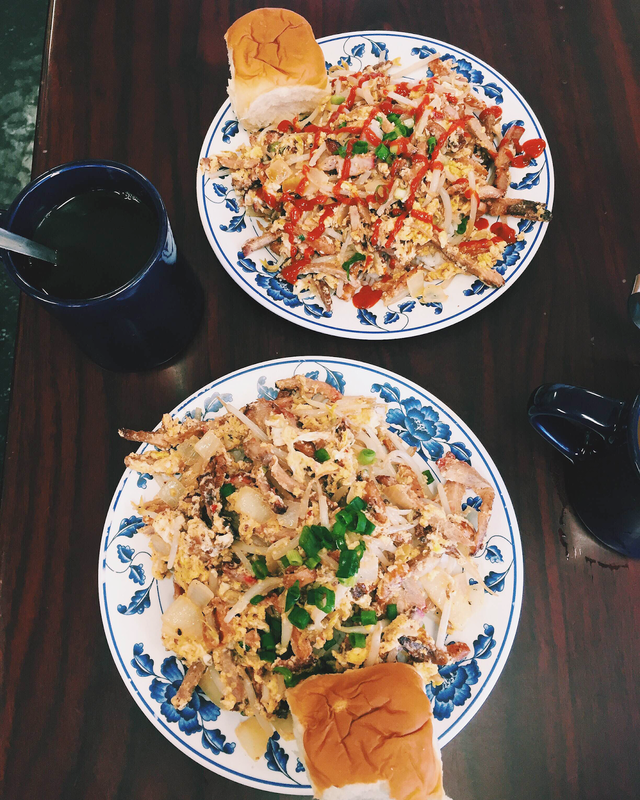 I've actually done articles just like this on other sites that I've blogged for, however updated versions are necessary when you basically live in the mecca of amazing breakfast & brunch eateries. 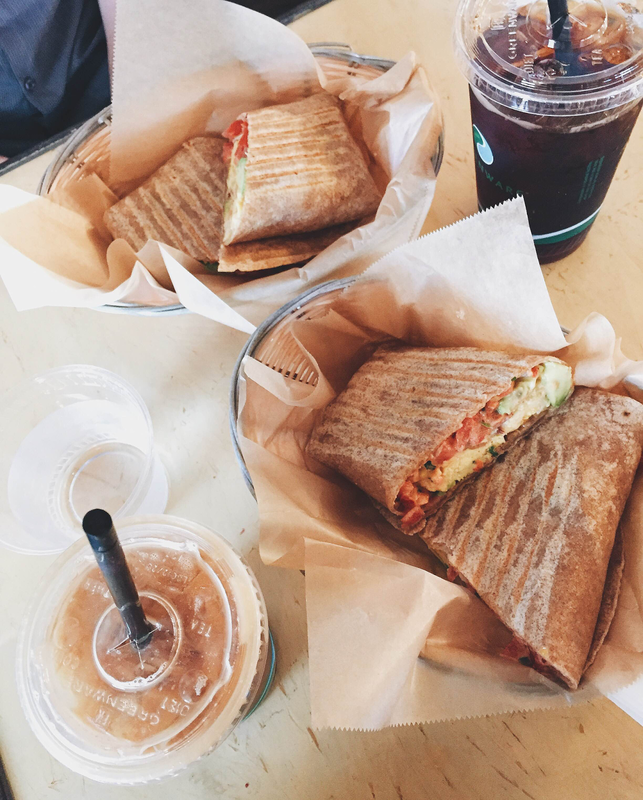 So with that said, here's a little guide for the next time your LA adventure wants a tasty, late morning feast. Located in Venice, Gjusta is a stunning artisan bakery that has a layout as unique as the food itself. The aesthetic is the perfect mix of rustic meets industrial, with a sleek and sprawling kitchen, counters lined with eye-catching pastries and breads, and wooden tables nestled in an outdoor eating area. The real art, however, is with the food. 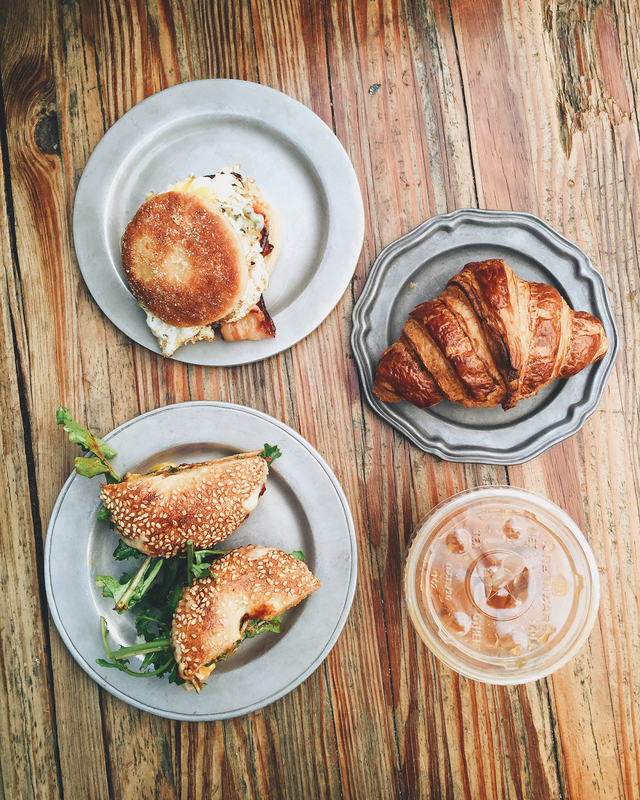 The photo you see above is from the last time I was there, with the bagel egg sandwich being mine and the english muffin egg sandwich being my boyfriend's. I can't even begin to tell you guys how insanely delicious the bagel on my sandwich tasted. Just that alone was enough to get me hooked, and that's not even counting all the other delicious add-ons inside the sandwich! The croissant was pretty great as well. To all my fellow bread and brunch lovers, Gjusta is the spot to be. Just like with Gjusta, The Butcher's Daughter is literally the definition of interior design goals. Natural lighting, copper accents, rustic touches and lovely foliage make up this gorgeous spot on Abbot Kinney, and the food is certainly just as exceptional. 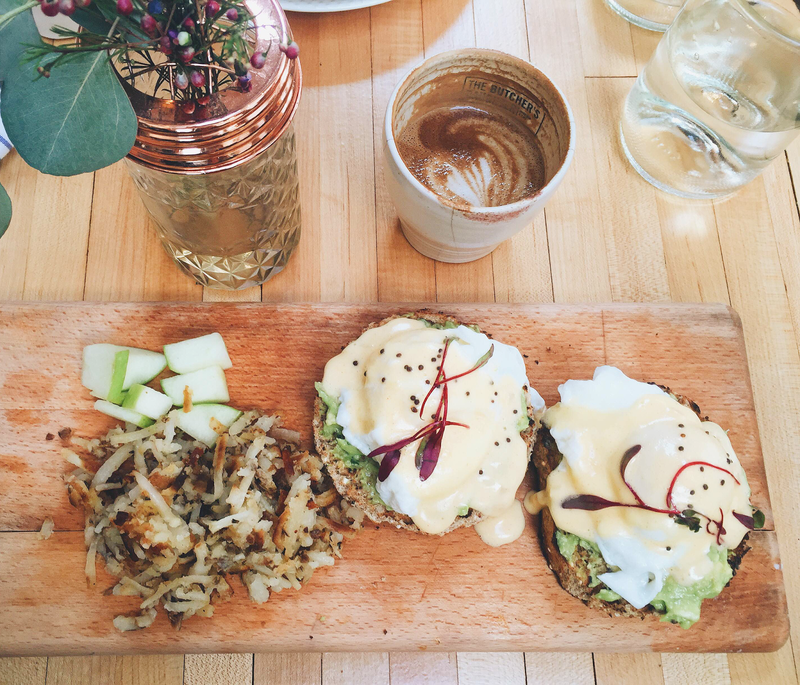 My personal favorite combo is the avocado toast eggs benedict with an almond flat white on the side. If you're feeling adventurous, treat yourself to the breakfast pizza. Because if it has a fried egg on it, it counts as breakfast right? I've been in love with Rutts well before I even moved down here, and I can honestly say that I'm still just as hooked. Their famous Royales are by far my favorite item on the menu, as they really have that authentic, home-cooked taste that you don't find all too often in restaurants. When I'm not getting a Royale there (which, realistically, is not too often) I'm all about their french toast. It's homemade, made with King's Hawaiian bread and served with coconut syrup. Too good. If you're looking for a delicious, classic breakfast then The OP Cafe is your spot. Their menu for the most part (there are certainly some exceptions) seems to consist of standard breakfast items, such as omelettes, pancakes and eggs benedict. Don't be fooled, though - they're anything but basic! Everything I've had there so far has been fresh, flavorful and filled with that same incredible, home-cooked taste I mentioned earlier with Rutts. Just like with fashion, you can never go wrong with the classics. 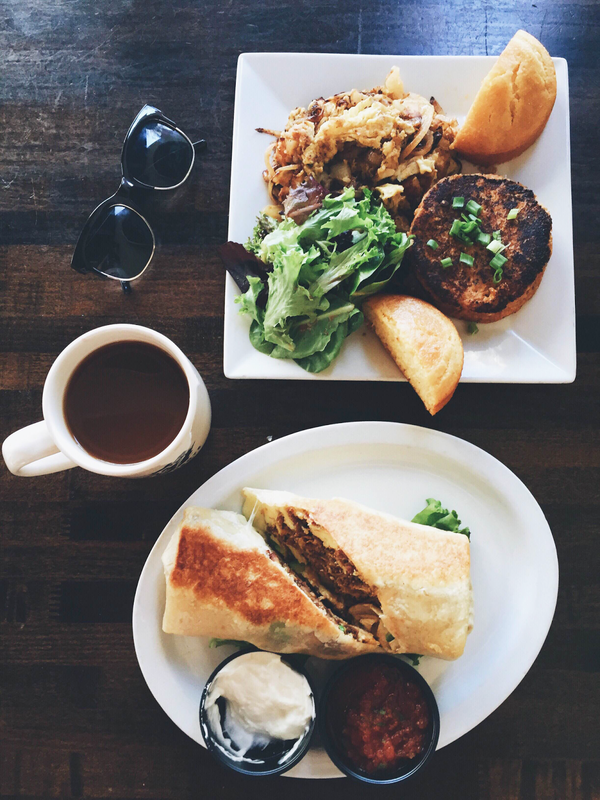 Located on Main Street in Santa Monica, Dogtown Coffee is a laidback and effortlessly cool cafe. The walls are decorated with gorgeous murals paying homage to the surfers and skaters of Venice, the music selection is rad and they make the greatest cold brew coffee to probably ever exist. When hunger strikes, treat yourself to the deliciousness that is the Munchies burrito. On a final note, I didn't even realize up until finishing this post that 3 out of the 6 meals on here consist of a breakfast burrito. So if you didn't know I was completely and utterly obsessed with them, now you do. 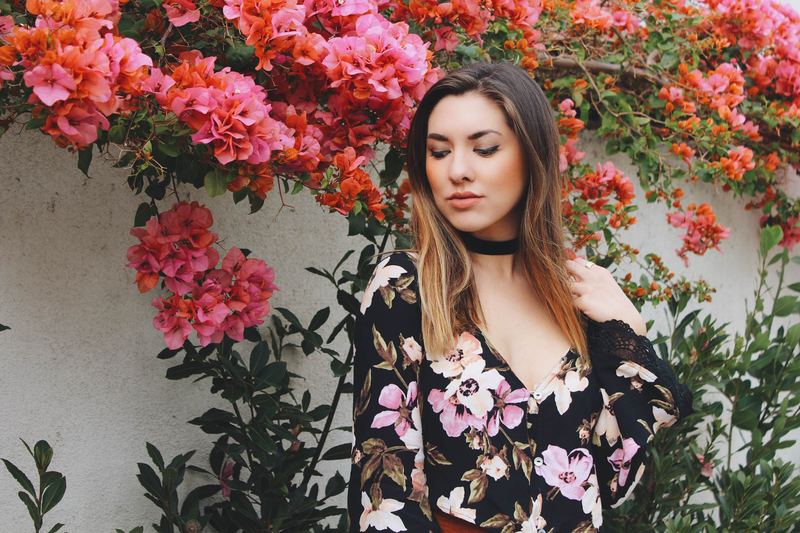 I had the absolutely wonderful opportunity of doing a guest post for TheChicBee, a fabulous style blog run by one of my fellow College Fashionista Style Guru's Bethany! This is the very first guest post I have done for another blog, so I couldn't have been any more excited putting together this piece. 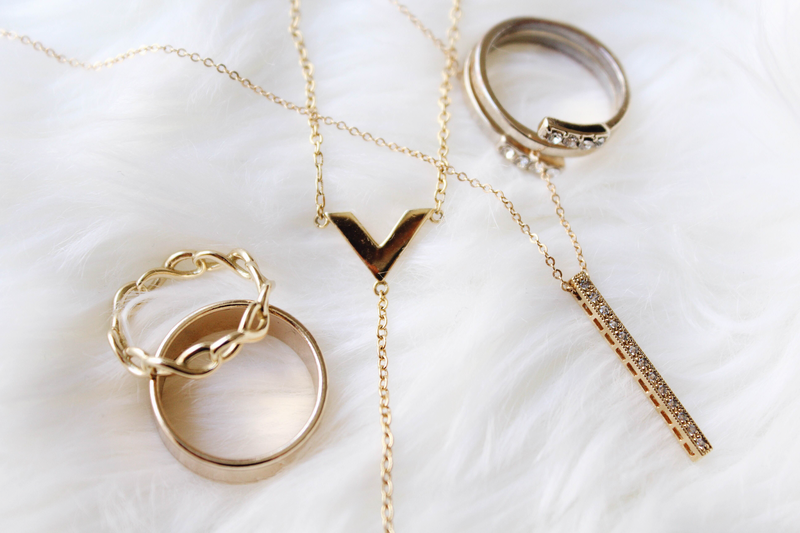 In it, I discuss the fine, gold jewelry trend that seems to be just about everywhere nowadays, and how you can rock these lovely accessories for yourself. 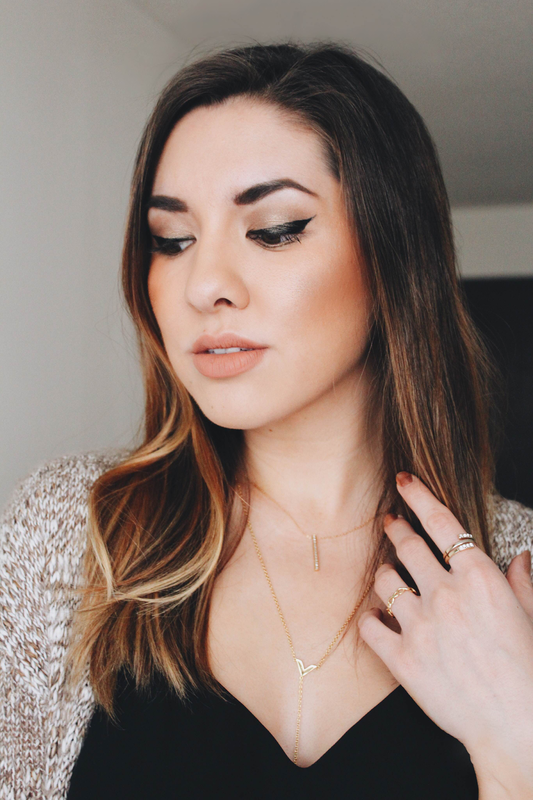 Here is a casual, daytime look with a hint of boho edge. First off though, let me just apologize for the small number of photos featured in this post! I'm very picky about which shots are put on here and sometimes, only a handful make the cut haha. Regardless, I think these still do a thorough job at showing off the outfit. 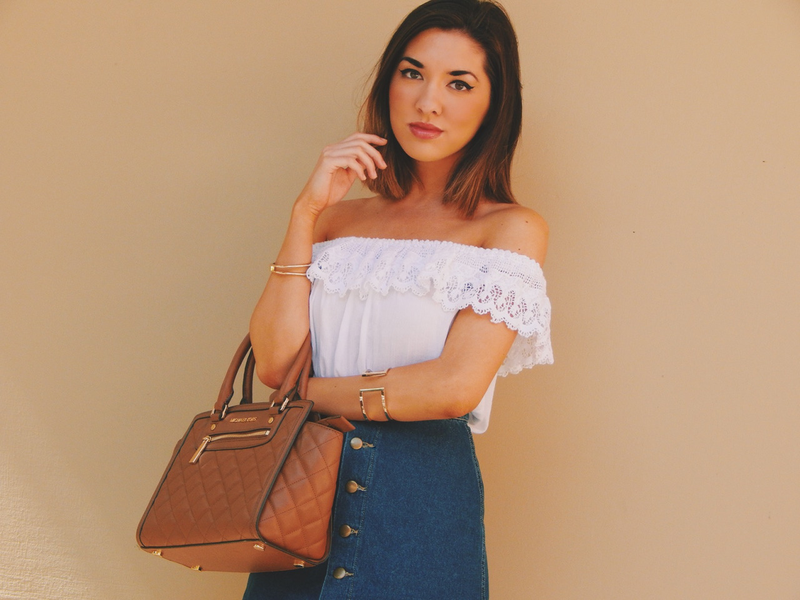 There isn't all that much to it since it's on the simpler side, but I do love the lace-up detail that's on this top. I've definitely fallen back into my lace-up phase, and with this being the third lace-up piece I've featured on here in a week's time, I'm sure its become pretty obvious. My jeans look white in these pictures, but they're actually a faded, light blue wash. I've featured light wash denim and camel on here before, and I just had to bring back the color combination again as I love how they look together. We all associate the acronym "LBD" with Little Black Dress, but what about the Little Blush Dress? Blush tones are absolutely stunning and unsurprisingly very trendy right now, so I feel it's about time we give it some recognition. The Rochelle dress (More options: 1, 2) is one of the many great deals I was able to snag during Reformation's holiday sales and I couldn't be any more pleased with what I received. The dress itself is snug and fitted, yet not too tight at all. It fits well in all the right places, the fabric is high quality, and I love the turtleneck detail. And of course, I'm obsessed with the gorgeous pink/ blush tone of it. I tend to fall head over heels for anything blush or rose gold so naturally, this dress has become an instant favorite. I took a little trip down memory lane the other day and selected a few top looks that I've posted on here over the past year. 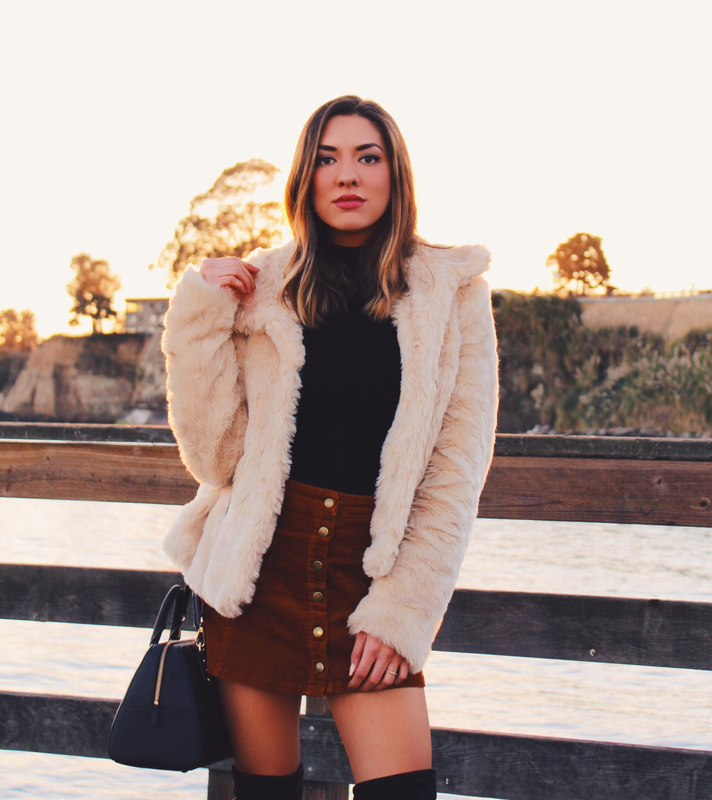 It was fun reminiscing on all of the outfits I've put together, but it was also crazy since these truly visualize just how much my look has changed over the progression of this blog! Not just with my appearance (I mean, look at how short my hair was....) but with my style in general. As I've mentioned before, my personal style is generally dictated by what is inspiring me at the moment. This can derive from a variety of different sources, whether it be film, music, my surroundings, a fashion show, or in some cases, an eclectic mix of all four. Just based off these selected looks alone, influences include '70s fashion, bohemian styles, city chic, and urban minimalism. And although I have a good idea as to what my current look is, not even I can predict the trend that's going to be consuming my wardrobe next! Regardless, my style is constantly evolving, and whatever I choose to wear at the moment is what I feel gives me the most confidence. Dressing up will always be my favorite form of creative self expression, and although the specific aesthetics may vary over time, their one constant similarity is that they are what make me feel fabulous.